Protecting Families In Fort Thompson, S.D. 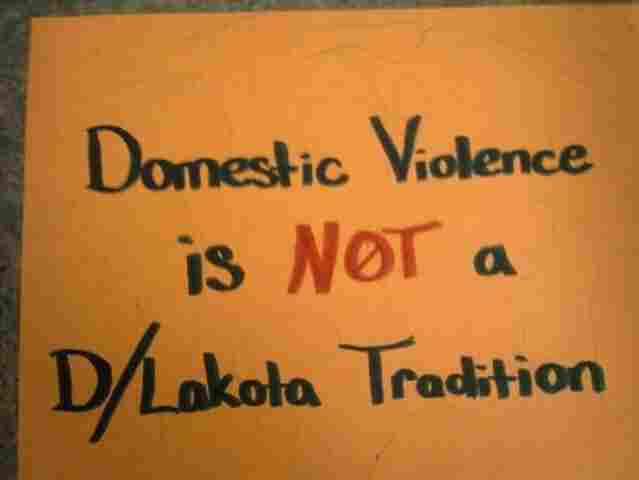 : Participation Nation The Wiconi Wawokiya, Inc. shelter serves more than 350 victims of domestic violence, sexual assault and child abuse. A handmade poster at Wiconi Wawokiya. In Crow, Wiconi Wawokiya means "helping families." The Wiconi Wawokiya, Inc. shelter — also known as Project SAFE — is on the Crow Creek Sioux Indian Reservation in central South Dakota. It serves more than 350 victims of domestic violence, sexual assault and child abuse. "The needs are great," says the program's director Lisa Thompson-Heth. The center provides an array of services, including crisis counseling, medical assistance and legal advocacy. The reservation spreads into three counties, including Buffalo County, the poorest in the country. According to the center's website, Wiconi Wawokiya, Inc. "has hope for a better tomorrow without violence in our community."